Support ongoing and implement new subbasin planning through a Columbia Basin watershed program. In the Columbia River Basin, more emphasis has been placed over the last decade on implementing a watershed/landscape approach towards natural resource management. This has resulted in collaborative decision-making processes by virtually all stakeholders in each subbasin. In many subbasins, tribes are taking the lead. Many funding opportunities now require evidence that a landscape approach has been implemented and projects prioritized. As the number and complexity of watershed-related activities continues to increase, meaningful engagement and partnerships with the tribes become mandatory. In 2000 the Northwest Power and Conservation Council (NPCC) adopted a new Columbia River Basin Fish and Wildlife Program that established goals and objectives for all the basin’s fish and wildlife populations. The program also required subbasin plans for all tributaries and sections of the main Columbia and Snake rivers (in the United States) be locally developed. Each subbasin plan included information on all the existing fish and wildlife programs, activities and management plans (Inventory); a biological analysis of the potential for fish and wildlife survival improvement (Assessment); and a plan with a vision, biological objectives to measure and quantify fish and wildlife populations and environmental conditions, strategies needed to achieve the biological objectives, and a research, monitoring and evaluation plan for the actions and results (Management Plan). By 2005, 58 subbasin plans were developed collaboratively by state and federal fish and wildlife agencies, tribes, local planning groups, fish recovery boards, and Canadian entities where the plans addressed transboundary rivers. Historical, current and future fish and wildlife recovery actions needed in each subbasin were documented. The subbasin plans were adopted as new amendments to the Fish and Wildlife Program. Subbasin plans, which will be updated every 10-15 years, integrate strategies and projects funded (not just by Bonneville Power Administration) so that each plan serves the NPCC’s purposes under the Northwest Power Act and also accounts for Endangered Species Act and Clean Water Act requirements and other laws governing natural resource management as much as possible. The 23 subbasins of direct concern to the four tribes can be viewed at Subbasin Plans. The NPCC and the Bonneville Power Administration (BPA) now use the subbasin plans as one of the sources that guide implementation of projects funded under the Columbia River Basin Fish and Wildlife Program, which directs more than $140 million per year of BPA electricity revenues to protect, mitigate and enhance fish and wildlife affected by hydropower dams. In 2008 the Umatilla, Warm Springs, and Yakama tribes and CRITFC signed the Columbia Basin Fish Accords with the BPA, the U.S. Army Corps of Engineers and the Bureau of Reclamation. This agreement guarantees the availability of $600 million for salmon restoration projects throughout the Columbia Basin through 2018. In return, the tribes agreed to not litigate for additional fish passage at the dams or the breaching of Snake River dams during this time period. Although the Nez Perce Tribe did not sign these agreements, the tribe continues to get BPA funding for priority projects. Another key tribal salmon recovery funding source for watershed projects is the Pacific Coastal Salmon Recovery Fund administered by National Marine Fisheries Service. Since 2000 the CRITFC tribes and CRITFC itself have completed 214 projects and currently have 60 ongoing ones in the basin under the Pacific Coastal Salmon Recovery Fund, having received a total of $23.2 million through a competitive process. Recent findings indicate watershed restoration can revitalize local communities where the work occurs (Ecotrust 2012). For example, every $1 million invested in restoration by the Oregon Watershed Enhancement Board supports 16 full-time equivalent jobs, along with $589,000 in wages and $2.3 million in overall economic activity. The study was not specifically focused on tribes. In the next NPCC amendment process beginning 2013, the tribes should be the lead entity in the updating and implementation of the subbasin plans that encompass the ceded territories. Promote tribal success stories and advocate for continued funding under the Columbia River Basin Fish and Wildlife Program, the Pacific Coastal Salmon Recovery Fund and other sources. Continue or realize tribal participation in community-based watershed councils to coordinate and implement watershed restoration actions. Organize community-based watershed councils where appropriate. Explore the economic—as well as cultural—benefits of watershed restoration to the tribes. Promote all agency efforts to conduct habitat restoration projects and seek means to encourage private entities to participate in these efforts on private land. Promote public education on the merits of salmon habitat recovery and the linkage to job creation and on the benefits from ecosystem health. Promote programs that provide incentives for private landowners to create or improve riparian zones and keep streamside areas free of continuing impacts from agricultural activities, grazing, mining, and unnecessary human disturbance that reduce vegetation recovery. See Oregon DEQ (2007), Wu (2008), Abdalla (2008). Strengthen regulatory mechanisms that would hold industry and governments accountable for land use practices detrimental to fish. For example, two related cases are currently in the Supreme Court regarding whether runoff from logging roads can be regulated under the Clean Water Act (Decker v. Northwest Environmental Defense Center, No. 11-338, and Georgia-Pacific West v. Northwest Environmental Defense Center, No. 11-347). Also see technical recommendation Watershed Restoration. Grande Ronde River. Photo courtesy U.S. Forest Service. 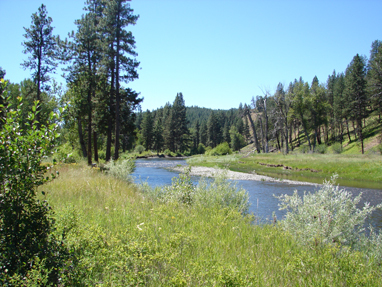 The Grande Ronde Model Watershed operates throughout the Grande Ronde Basin implementing projects on salmon-bearing streams and watersheds funded by BPA and Oregon Watershed Enhancement Board. Multiple entities, including the Confederated Tribes of the Umatilla Indian Reservation (CTUIR) and the Nez Perce Tribe, are engaged in the basin’s restoration. The Grande Ronde Basin is located in northeastern Oregon and southeastern Washington. CTUIR has revitalized significant tributary and mainstem segments, including McCoy Creek, Rock Creek and the upper Grande Ronde, where the tribe and the U.S. Forest Service removed mine tailings above Clear Creek. The dredge spoils piled in the streamside zone were leveled to allow the river to migrate and overspill its banks in floods. The Forest Service added woody debris to the mainstem in 2011 and 2102, continuing work begun two decades ago. The result: showpiece restoration sites. Is Watershed Degradation Outpacing Restoration? At a national level, the Clean Water Act resulted in improvement in water quality after its inception, but the nation’s rivers have been trending toward increased degradation in recent years (Palmer and Allan 2006). Freshwater fish taxa nationwide have also become increasingly imperiled (Jelks et al. 2008), with habitat degradation and invasive species as the principal cause. Given that restoration efforts nationwide are extensive (Palmer and Allan 2006), these national assessments are likely indicative of the kinds of continuing threats to restoration progress experienced in the Columbia River Basin. Within the Columbia River Basin, large expanses of land bordering the mainstem Columbia, Snake and Willamette rivers were rated as having a very high risk of habitat degradation given the human uses present (National Fish Habitat Board 2010). In the western mountain region of Oregon, Washington and Idaho, about 68% of streams are rated as having fair to poor conditions related to riparian disturbance (EPA 2013). Because the rating methodology used did not highlight non-point sources, it is likely that the threat is worse than portrayed: Non-point-source impacts to aquatic habitats are the current major source of impairment in the Columbia Basin and the legal ability to control them is poor and essentially voluntary. Because of the inadequacy of national and regional habitat condition trend databases, it is difficult to make assessments of our ability to achieve a net improvement in habitat condition (Bernhardt 2007). Monitoring now being done in the Columbia Basin is attempting to apply advanced statistical procedures and robust habitat and fish monitoring protocols to establish trends in aquatic habitat condition. In the future, these monitoring data may tell us if we are indeed making the headway needed to restore the watershed habitat that fish and people alike depend on. Also see the new technical recommendation Climate Change.